Connect with Absolut on Facebook, Twitter, or your favorite liquor store. It’s Friday night and you’ve had a long day at work. All you really want is to have a drink with your friends, unwind, and have some laughs. What to order? Beer won’t do since you don’t feel like drinking a loaf of bread. Whiskey? It wasn’t THAT bad of a day. Now vodka…that’s refreshing. A vodka cocktail will do the trick. 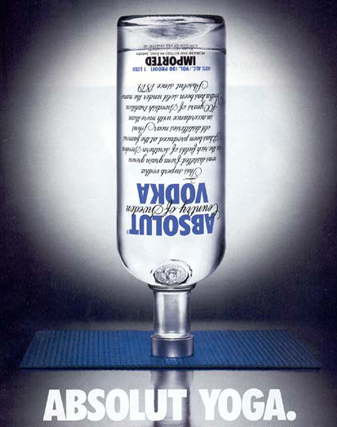 It’d be difficult to pick our favorite vodka based on taste, but for campaigns, no one beats Absolut’s “ABSOLUT _____”. Have no idea what we’re talking about? Doubtful, but we’ve included one of our favorites to the right. There’s just something about vodka and exercise that we find exquisitely funny. What makes this campaign iconic? It makes any niche market on earth instantly important should Absolut turn its attention that way. Imagine that ability to make your campaign fit any interest you want it to. You’re able to scale your campaign, target it, mold it in any way you see fit to meet that target audience’s interests. Even if it is an incredibly small and specific audience. What’s that? ABSOLUT brilliance.